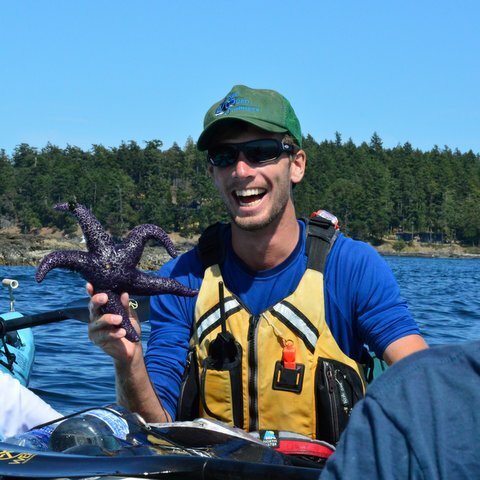 We’re frequently asked why we only offer sea kayaking with certified guides. Why? The first and most important reason is safety. Let’s talk sea kayaking 101! The water around San Juan Island is diverse and fast changing. Topography of the ocean floor includes depth changes that in many spots plunge very quickly along oceanic shelves caused by ancient subduction zones. Even our island “count” changes day-by-day based on tidal exchange, leaving land mass exposed and then hidden below the surface in the matter of hours. Massive amounts of water fluctuate in-and-out of the Salish Sea from surrounding straits, gulfs, channels, and passes. This upwelling of freshwater from surrounding rivers and run-off combined with saltwater from the Pacific Ocean creates an extremely dynamic body of water. If you don’t know where and when water pushes or pulls (ebbs, floods, and rips) it can catch you by surprise. The sea is very powerful and can move quickly. This is why it’s important to always check local tides and currents before a trip. An element to keep in mind is our cold-water temperature which creates a hypothermia risk. Paddlers should be prepared in the case of exposure to capsize and know proper safety procedure to exit and re-enter a kayak efficiently. Each of our guides has a safety talk at the beginning of the tour covering what we do in the case of an emergency. First aid training and a first aid kit should be brought on every tour. Guides have radios to contact the Coast Guard, triangulate location, check wind/weather updates, and communicate with other boats and paddlers on the water. Knowing water traffic patterns for channel crossing is very useful. Ferries, cargo ships, yachts, seaplanes, oh my! With a certified guide, or proper training and awareness, the San Juan Islands are a beautiful and amazing place to paddle. So, how do we prepare for these elements? Here are some safety tips. Communicate. Let someone know your plan. Paddle with friends. Carry a radio. Paddle with: spray skirt, spare paddle, bilge pump, first aid kit, tow belt, snacks, water, knife, extra layers, map, and compass. Check that your equipment is properly maintained and ready to be on the water.